Dr. Ambedkar Sheti Vikas Va Sanshodhan Sanstha (ASVSS) is a Maharashtra-based NGO that mainly works in four areas: a) Land Rights for Dalits, who are deprived of the land that was given to them by the British and was taken away by the state government. ASVSS helps those individuals to acquire land from the state government and distribute it to rightful owners. In addition, ASVSS also helps to develop barren land into productive land, by providing training in organic farm training; b) Women Empowerment: ASVSS provides training to Dalit women (victims of domestic violence), with the objective of creating women entrepreneurs through the formation of Self Help Groups and encourages them to fight for their own land & house; c) Anubhav Shiksha Kendra: These are activities for providing job-related training to youth; and d) Childrens Education: ASVSS owns an educational hostel (funded by the American Indian Foundation), that provides education to children of migrant families who are unable to send their children to school due to their weak financial situation. ASVSS helped around 600 families in Nagari Niware Society in Goregaon, Mumbai to acquire their land from the State Governments custody. In Sangola block, ASVSS is trying to acquire 945 acres of land from the state government for eight villages. Around 350 acres has been already acquired & distributed for these eight villages. Around 300 Dalit women have submitted their claims for their property rights. In nine villages of Sangola block, about 300 hectors of barren land had been distributed to 150 families. This was later developed into cultivated land despite being located in a drought prone area. ASVSS has awarded 1,200 acres of land in 22 villages. It has also helped form 22 Farmers Forums (Krishi Panchayat) in Sangola block. With the help from Times of Indias (TOI) Teach India initiative, ASVSS offers English speaking course to youth living in slums. This is a three-month course and guaranteed jobs have been provided by TOI. ASVSS had provided financial support to 60 SHG members for a goat-rearing program. Founder Lalit Babar along with his team has petitioned the Railway Ministry since 1990 to build Railway lines in Dongargaon and Sangola, as there were no transportation facilities available. After years of struggle & effort made by the team, a Railway station was built in Dongargaon, Sangola block in Solapur in 2009-10. 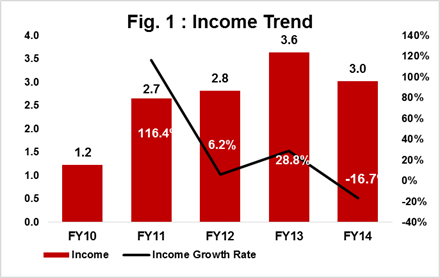 ASVSS total income declined 17% YoY to Rs3.02mn in FY14 (Rs3.63mn in FY13), due to a fall in grants received (Refer Fig. 1). During the year, 80% of total income was received through Grants from institutional & foreign sources vs 92% in FY13. During FY10-14, ASVSS spent on average, 58% on direct program activities, 34% on program staff cost and 2% on overhead expenses. Earmarked funds declined 23% to Rs0.5mn at the end of FY14 (0.7mn in FY12), due to the reduced grants received from ActionAid & Times of India (TOI). 5-Year total income CAGR rose by 25% during FY10 FY14. The YoY income growth rate during this period has been volatile, as the organization remains highly dependent on grants from institutions & foreign sources. Self Sufficiency Ratio (SSR) indicates an organizations ability to meet its operating expenses from its own income (service charges, interest income, and general donations). ASVSS SSR has increased marginally from 17% in FY13 to 20% in FY14, due to higher income received through General Donations. Grants have been received from Vikas Sahyog Pratishtha, Church for Auxliary & Social Action, ActionAid India, American Jewish World Service (AJWS) and Youth for Unity & Voluntary Action. ASVSS receives its income mainly through grants. Therefore to expand their projects in other locations, they will require additional funds. On a rough basis, they require around Rs4mn for expansion. ASVSS should seek funds from corporates on a long term basis, for their project expansion in other parts of Maharashtra. Need Social Activists. ASVSS emphasized the fact that they need social activists, who should have a good knowledge on the subject of land rights and can build and maintain relationships with political parties. ASVSS has three offices one in Mumbai and two in Solapur district. All the documents and records are maintained in the Sangola office in Solapur. The team formally meets on a monthly basis to review organizations performance. The Board consists of 11 trustees and none of the trustees take any remuneration. All the trustees are actively involved in promoting ASVSS programs.